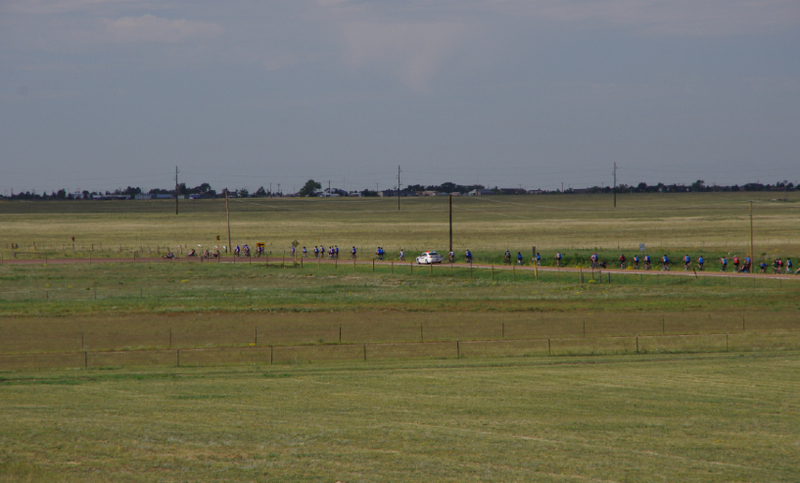 Early this morning I drove southeast onto the rolling plains of Peyton, Colorado. The land was in sharp contrast to the mountainous terrain I had explored last week. There on the prairies of Colorado, I found a group of wounded warriors and their support team who had come together from across the nation to ride bikes. Forty-seven soldiers who had served, or continue to serve, our country were gathering for a bike ride as part of the Wounded Warrior Project Soldier Ride. The riders share the common experience of war wounds both physical and mental. They also share the love of cycling. These men and women have found freedom and camaraderie on two (or three) wheels. The morning started like any other event ride, with riders getting their gear ready for the long ride ahead. 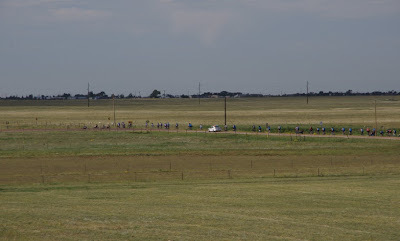 We talked of the beauty of the previous days ride through the Garden of the Gods, how a trip to Colorado had long been on the to-do list, how it was a perfect day for a bike ride, and about the bike equipment and set-up. 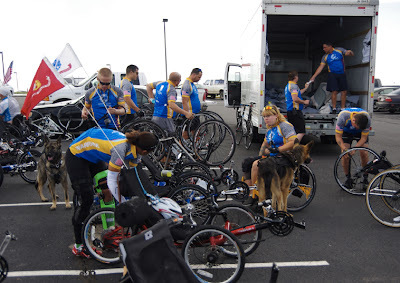 There was a clear attachment to the bikes - half the recumbent bikes were privately owned with the others purchased by the Wounded Warrior Project (WWP). Except for a few private bikes, the upright bikes were all donated by Trek Bicycles and widely adjustable to each cyclist's needs. 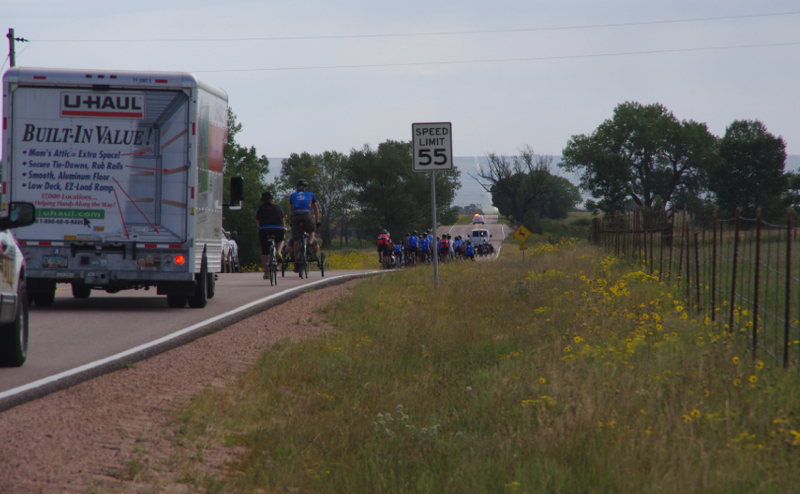 All the bikes are transported in large U-Haul trucks and fit specifically to each rider prior to the ride. There was also a clear attachment to each other. The riders stay in hotels together and share meals. Some have been on the same trips together, year after year, although they live in separate states. They look forward to these trips every year. 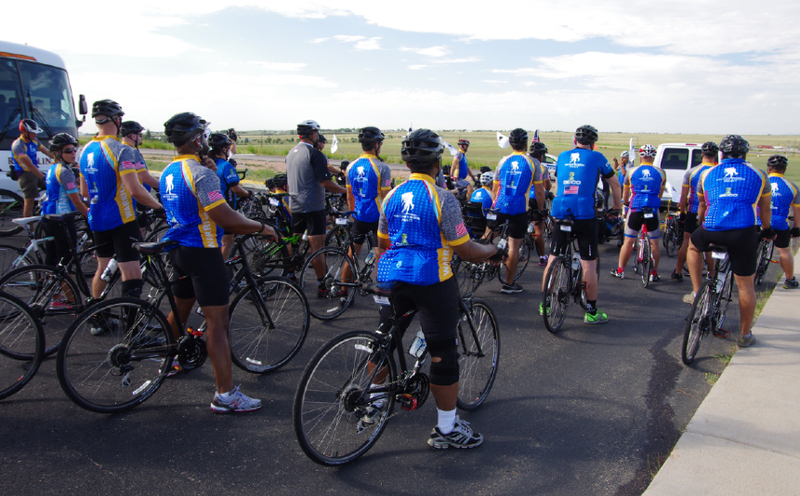 Those who are new to the ride are instantly brought into the fold - the Wounded Warrior Project Soldier Rides are a place to belong. 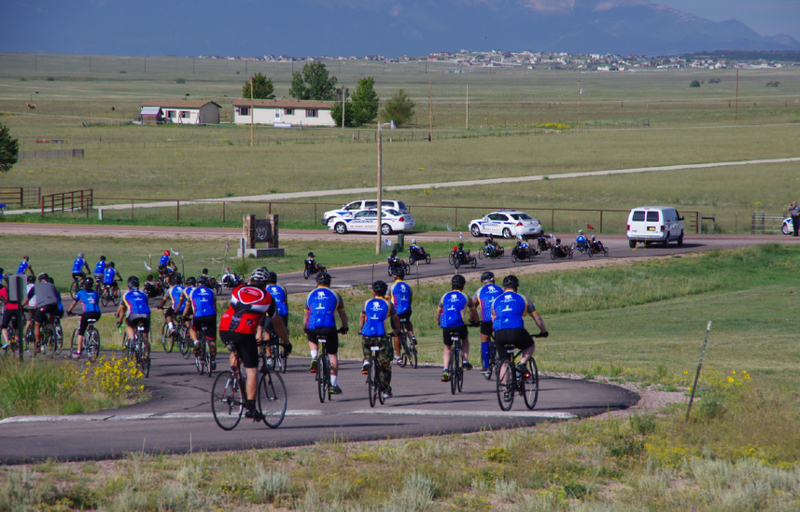 Here are the riders of the 2013 Colorado Springs trip of Wounded Warrier Project Soldier Ride . I met Soldier Rider Dan Curran this morning, he served 5-years in the Army, first as a combat medic in Fort Hood, Texas, and later with a tank division in Iraq for two years. Dan suffered back and spinal injuries and PTSD. He and his wife Debra now live in Washington state where they both help as mentors to other Wounded Warriors. Dan is also attending nursing school. This is Dan's 4th year on the ride, he happily completes two rides a year. He told me he used to be 80 pounds heavier, which I never would have guessed. 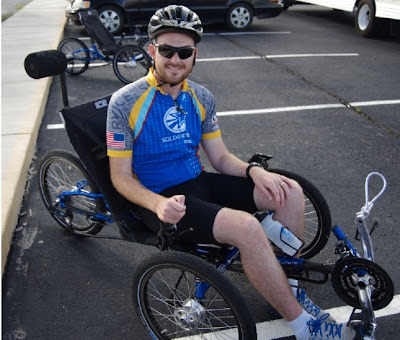 The first three years, Dan rode an upright, but he said his balance is worsening as his legs are losing more strength, so he was fit on a recumbent this year and likes it. It takes a bit to learn the steering he said, but it is safer for him and still lots of fun. Dan will be back again next year. 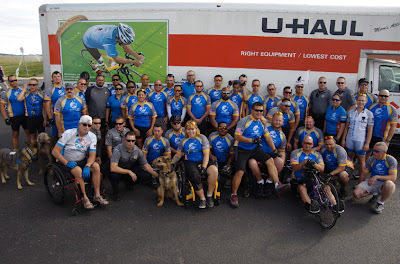 The Wounded Warrior Project Soldier Rides are sponsored by Geico (Insurance), U-Haul (Trucks), and Trek (Bicycles) and are considered a rehabilitative cycling event. Rehabilitative through "health and wellness, camaraderie and healing." Many of the riders have made tremendous progress in their rehabilitation through the sport of cycling. 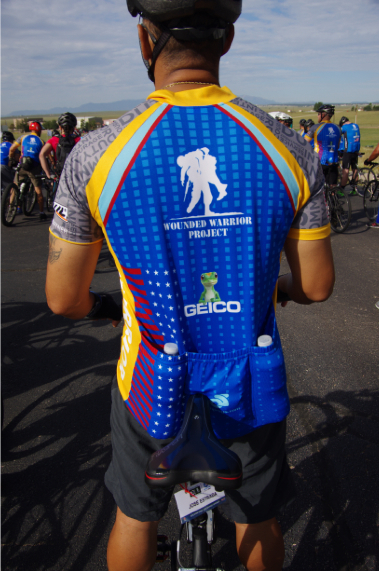 The Wounded Soldier Project jersey. Every rider wears one. WWP Trek bike. Each upright and recumbent bike is fit considering the individual rider's injuries. I drove home listening to the news on the car radio of the tragedy in Syria and the looming decision for action or non-action facing our nation. I looked in my rear view mirror as the prairie faded in the distance behind me and thought of the inspiring cyclists I had just met continuing their ride. I imagined those men and women pedaling in support of each other, pedaling to feel physically strong, pedaling to make the future better, together. 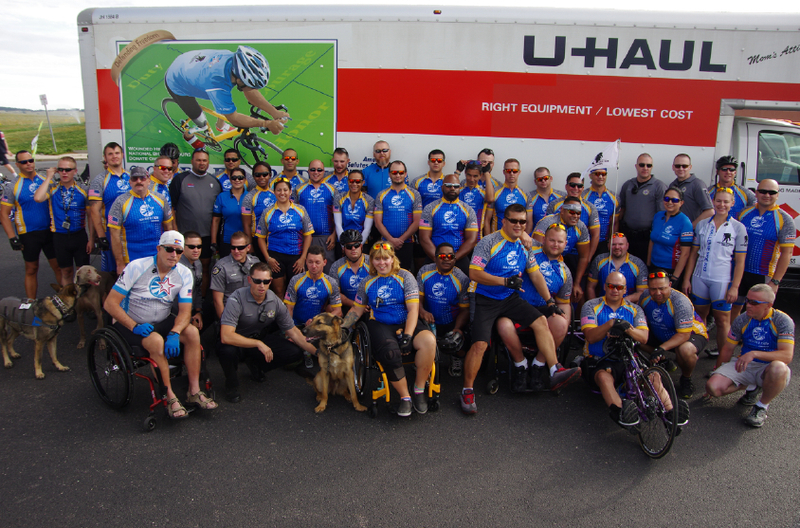 Soldier Ride will be coming to a town near you. It felt really good to be with this group of riders this morning. I wish them well in their healing and in their journey on a bicycle and in life. Next time they come through town, I want to go ride with them, because they told me those recumbents are fast! 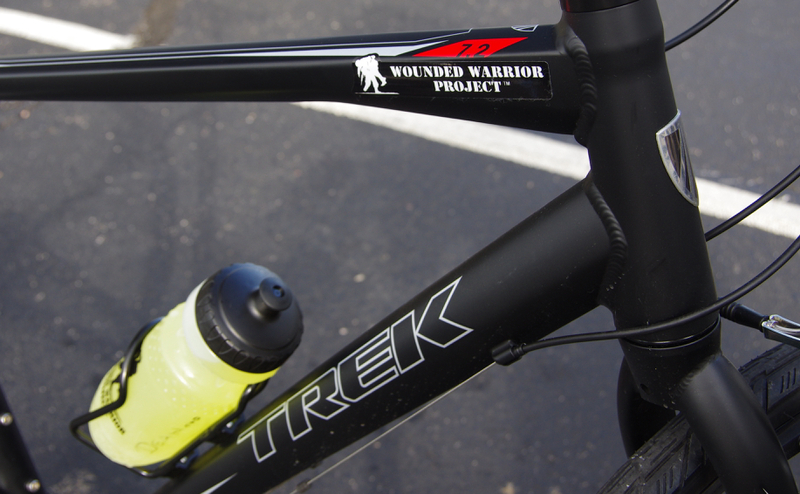 Soldier Ride® began in 2004 when civilian Chris Carney cycled more than 5,000 miles coast-to-coast in support of WWP. 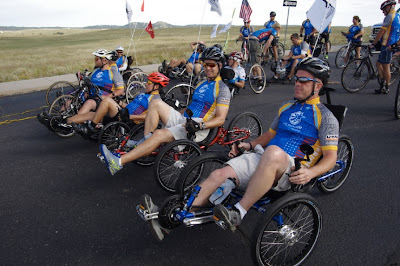 In 2005, Carney again cycled coast-to coast, this time with several combat-wounded veterans of Iraq and Afghanistan. 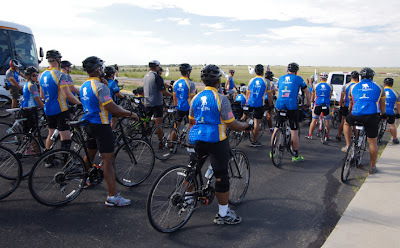 Soldier Ride is a physical health & wellness program of WWP, which envisions a generation of wounded veterans well-adjusted in body, receiving the care they need to maximize rehabilitation and live active and healthy lives. Through peer support, adaptive sports, health, nutrition, and recreational activities, WWP helps warriors achieve independence and pursue an excellent quality of life.